GatedTalent, the platform connecting senior executives with leading executive recruiters globally, is delighted to announce major landmarks in terms of both executive profile growth and executive recruiter access. The GatedTalent platform contains biographical and aspirational information of senior executives, with the profiles created and maintained by the executives themselves. The company is delighted to report a significant increase in member profile creation, with August being the best month for new platform registrations, delivering an increase of more than 50% in newly created profiles when compared to our previous best month. GatedTalent is currently receiving well over 1,000 new registrations each week. As previously noted, the membership base is exceptionally senior, with approximately 10% of its members being currently employed in a CEO role. 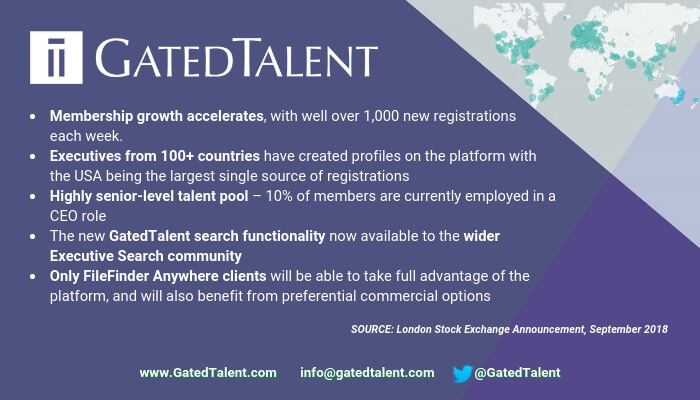 Furthermore, GatedTalent’s membership pool is highly diverse, with executives registered from more than 100 nations, with the United States being the largest single source of registrations. GatedTalent is also delighted to announce that, while users of the FileFinder Executive Search CRM will continue to benefit from unique integration with the platform, the GatedTalent search functionality will now be made available to the wider Executive Search community.